You might think it’s only your problem. Customers fill their carts, they’re ready to pay, then they just leave! Annoying, right? Well, without a doubt, every single ecommerce retailer and marketer out there has had some experience with cart abandonment. 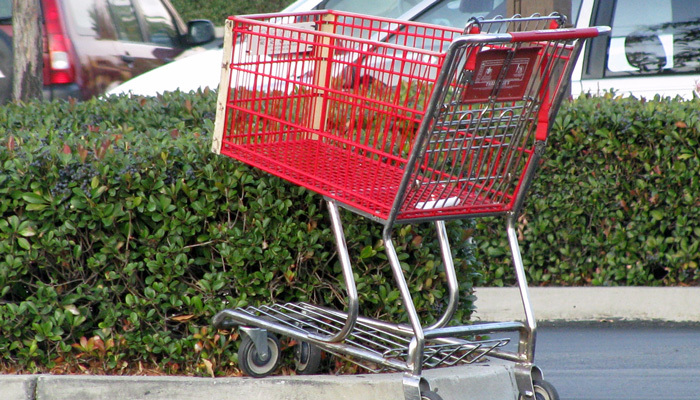 According to Business Insider, in the US 50 percent of carts are abandoned for a whole host of reasons. Most of these reasons have something in common: the checkout process could be better. 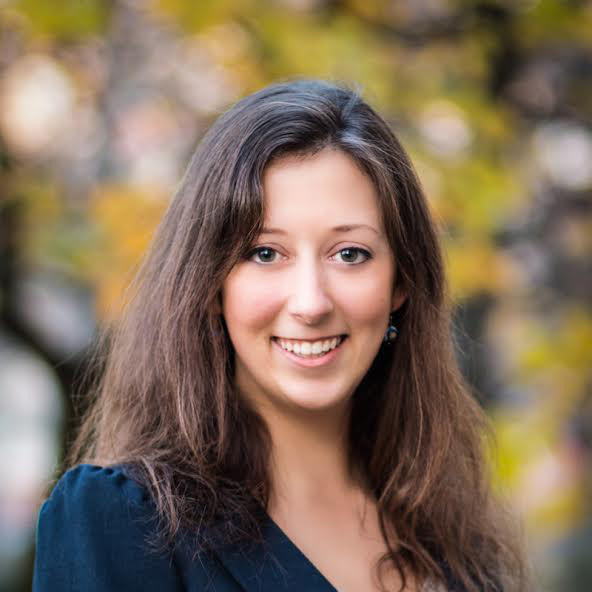 Luckily, each of these abandonment behaviors can be reduced with the right incentives. Sometimes registration is a pain. It requires extra steps and when you just want to buy a product – and quickly – extra steps are the last thing you want. As much as 39.1 percent of shoppers surveyed feel the same way. So in order to reach this type of shopper, there should be an incentive for signing up. And, no, being a part of an email list isn’t incentive. A loyalty program is a great way to offer special rewards to those who register, and it also lets them know there are more ways to earn points and get even more rewards as they shop. It’s all about providing an incentive, which cushions the blow of all that data entry and helps you retain your customers. Staples tells it like it is. You sign up? They give back. Do the same by making the incentives clear. According to Business Insider, 23.5 percent of customers leave their carts behind the moment they find out about shipping costs. In terms of design, it’s always a great convenience to display shipping costs earlier on in the process to prevent this type of cart abandonment. But no matter where you display shipping costs, consider using shipping as a reward opportunity. Offering free shipping as a loyalty benefit is great news. Free shipping on the first purchase for loyalty members is the least expensive way to go and once members are signed up, you have a new opportunity to keep in touch and send other types of offers to remind them that you’ve got some great products in store. Several major ecommerce retailers offer free shipping all the time as a benefit for being a loyalty member, think Amazon Prime or Bloomingdales. That’s a great combo, since it gives members the convenience of ecommerce without the extra cost that’s associated with shopping online. 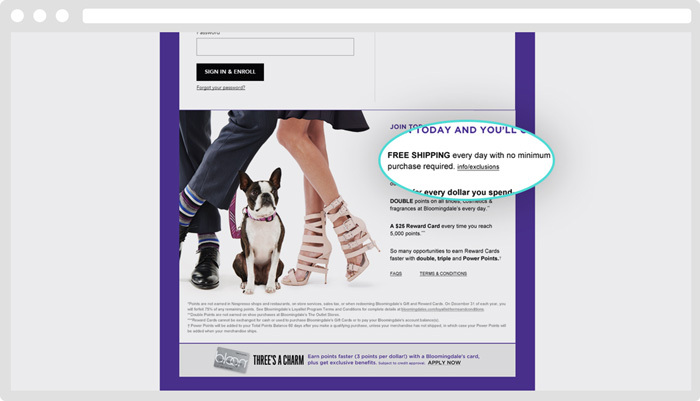 One of the benefits of joining the Bloomingdale’s Loyallist program is – you guessed it – free shipping! Along the same lines as unexpected shipping costs, some customers leave because once they get to checkout, they see that the price in general was more than they expected. Making offers easily visible and accessible is key for this group. 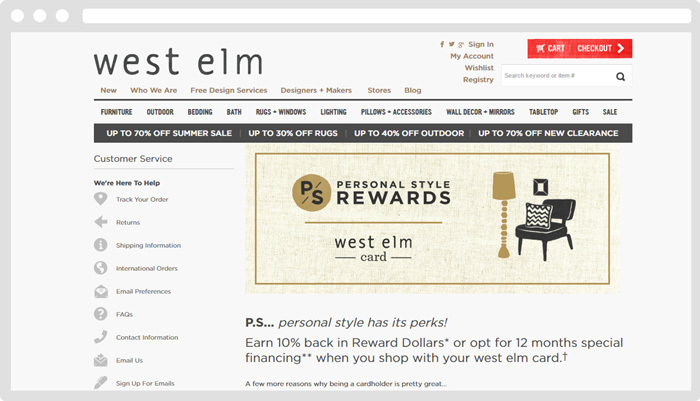 Instead of describing how to do this, let me show you what West Elm is doing for their customers. Secondly, they’re advertising their loyalty program in clever places, where shoppers will notice. For example, right next to product search results. If you’re putting your offers alongside your fabulous products, it’s a pleasant surprise that can’t be missed. This is a common one. People are out there on the world wide web searching for bargains. Part of that research means shoppers are going nearly all the way through the checkout process, to make sure they know about all costs involved. This is probably the most difficult group of all, but we know one thing for sure: they’re either doing product research or hunting for a bargain. So making them an offer might be just the ticket to gaining their business! Where exactly can you get their attention? Make sure you’re telling them about your loyalty program in several different places, including on the product page and in checkout. 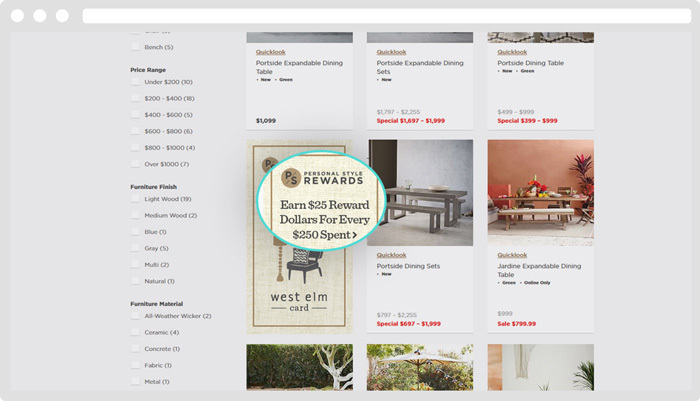 And don’t forget to display some offer or reference to your loyalty program visibly on the homepage. Offering multiple ways to learn about the reward programs gives you a greater chance of grabbing attention. Here’s another tip: Use your loyalty program to help you get more reviews. Offering compensation for reviews is going to help researching visitors by giving them the information they’re actively looking for. If they like what they see without having to leave your site, then you’ve got a much better chance at conversions. 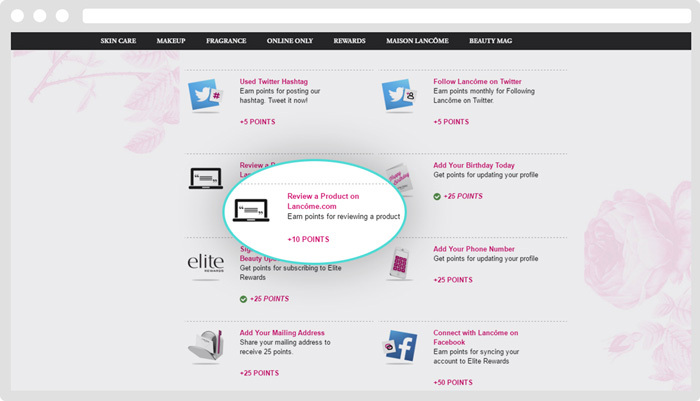 Lancome has a fun loyalty program that rewards customers for many different kinds of activities – including leaving reviews. Ok, let’s take a step back in time, well before anyone actually reaches checkout and think about how to reduce guest checkout by actually getting more “qualified” shoppers in your store. Focus on referrals instead of advertising to anyone-and-everyone on the interweb. Now, hold on just a minute! I’m not saying you should cease all advertising, because we all know it’s a great way to improve brand recognition and find interested shoppers. What I AM saying is that it’s much less expensive to focus on your current shoppers and their friends (who, as friends, will already have a lot in common with each other – including interests and style). Capiche? 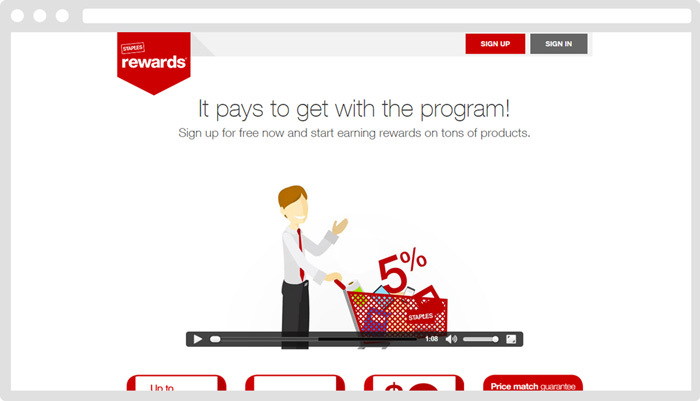 Give your current shoppers an incentive to bring in referrals via your loyalty program. Reward both the referrer and referred shoppers who make a purchase on their site. Two birds, one stone: these new shoppers are much more likely to become the next group loyalty members to refer even more customers to your store. Photo courtesy of Daniel R. Blume via Creative Commons.